The Last of Sheila (1973) is a witty, cynical, suspenseful, but mostly extremely clever and well-acted whodunit. It was not the smash that it should have been. It made less money that summer than forgettable films like Battle for the Planet of the Apes and Lady Ice and was aced out of the 46th Academy Awards, though it did win an Edgar Award from the Mystery Writers of America. Today's it's something of a cult film and a remake is in development, though it'll be hard to top. The film is noteworthy as the only movie written by composer/lyricist Stephen Sondheim and actor Anthony Perkins (Psycho). During the late '60s and '70s the pair staged elaborate scavenger hunts around Manhattan with various celebrity friends. The Last of Sheila is itself a puzzle film, ingenious and intricate though it plays fair with its audience. Attentive viewers can unravel its mystery, as I immodestly boast (and early on, too). In what is perhaps a testament to the film's cult following, an April 2004 DVD version quickly went out of print (Did they sell out their print run, I wonder?) and used copies, even now, are fetching upwards of $50. Wisely, Warner Bros. decided to reissue The Last of Sheila as a (region-free) Warner Archive title, complete with the original DVD's extra features. If you missed before, this Warner Archive release is strongly recommended. Gossip columnist Sheila Greene (former Hammer ing�nue Yvonne Romain) leaves a Bel-Air party and is struck and killed by a hit-and-run driver. One year later Sheila's widower, rich and powerful movie executive Clinton Greene (James Coburn) invites six guests to spend a week aboard his yacht in the Mediterranean. The guests are down-on-his-luck director Philip (James Mason), talent agent Christine (Dyan Cannon), sexpot actress Alice (Raquel Welch), her ambitious manager-husband Anthony (Ian McShane), frustrated screenwriter Tom (Richard Benjamin) and his wife, Lee (Joan Hackett). Clinton, an incorrigible parlor game enthusiast, has planned an elaborate one for his guests, spread over six evenings. Each of the six guests is assigned a secret identity, typed on an index card, e.g., "You are a SHOPLIFTER." 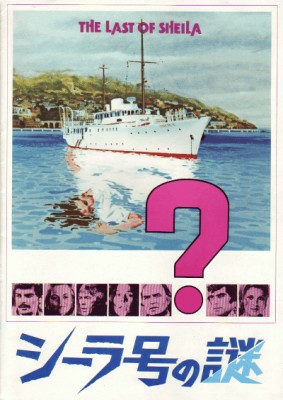 On each of the six nights, the yacht is to drop anchor at a port town, and the six will disembark in search of clues leading them to proof of the cardholder's identity. The evening's game concludes when the subject of that night's secret discovers the proof incriminating him, while those who find it before him are awarded a point. Each card holds an embarrassing secret, not applicable to the cardholder but as soon becomes clear, one of the five other guests. Does Clinton plan to expose the skeletons in everyone's closet, possibly revealing his wife's killer in the process? The complexity of The Last of Sheila invites multiple viewings. Researching this review I was surprised to see how many major plot points and revelations other reviewers got wrong. * Indeed, the mystery/game aspects are far more intricate than just about anything that had come before it, the film of the play Sleuth being an exception and possible influence. Murder mysteries that had come before - Sherlock Holmes and Charlie Chan movies, for instance, or the '60s Miss Marple movies - were superficially complex but as mysteries really were cheats. The audience had no real chance to solve them and often their plots didn't hold up to scrutiny. The following year Murder on the Orient Express (1974), incidentally co-starring Perkins, ushered in a new wave of Agatha Christie movies and, eventually, long-running TV shows like Poirot as well as, tangentially, the Jeremy Brett Sherlock Holmes series. Ironically, the first of the Orient Express follow-ups was Death on the Nile (1978), with many similar elements, though it's inferior overall. The acting is outstanding all the way 'round, particularly the performances of Richard Benjamin and James Mason, both greatly underrated actors. DVD Savant noted the film's All About Eve-like cynicism toward show business ambitions and that the notoriously fickle nature of fame extended to the alleged sadistic casting of has-beens and never-quite-wases, but I don't see that. Rather, I suspect all involved were probably quite proud to be associated with such an intelligent and adult film of this caliber. The Last of Sheila is presented in 1.78:1 enhanced widescreen, approximating its original 1.85:1 original aspect ratio. Presumably the transfer is the same as the 2004 version, but to my eyes it has always looked rather muddy and worn on home video. If a remake materializes hopefully it'll be remastered for release in high-definition. The mono audio is adequate and, unusual for a Warner Archive release, this one offers English, French, and Spanish subtitle options. Supplements from the 2004 DVD have been ported over, most notably a charming commentary track featuring Benjamin, Cannon, and Welch, as well as a 16:9 enhanced trailer (not listed on the packaging). Though it really deserves to be released to Blu-ray, chock-full of extra features, until then this Warner Archive release of The Last of Sheila is an absolute must. A DVD Talk Collector Series title. * Mild Spoiler: Many of the reviews I looked at incorrectly state the purpose of Clinton's game is to expose the "hit and run killer." It's not.